The Panama Canal is a ship canal in Panama that connects the Atlantic Ocean (via the Caribbean Sea) to the Pacific Ocean. It is 77.1-kilometre (48 mi) long and cuts across the Isthmus of Panama and is a key shortcut for international maritime trade between the two oceans. The skyline of Panama City from Ancon Hill. Photo by Brian Gratwicke, License: CC-BY-SA-2.0. Click image for larger view. There are locks at each end of the canal to lift ships up to Gatun Lake. It is an artificial lake which was created to reduce the amount of excavation work required for the canal, which is 85 feet above sea level. Currently the locks are 110 feet wide. A third, wider lane of locks is currently under construction and is due to open next year in 2015. It was started by France in 1881, but because of engineering problems and high mortality due to disease it had to stop being worked on. After this attempt failed and 21,900 workers died, the project of building a canal was attempted and completed by the United States in 1904. After a decade of work the canal was completed. It was officially opened on August 15, 1914. Panorama of Pacific entrance of the canal. Left: Pacific Ocean and Puente de las Americas (Bridge of Pan-American Highway); far right: Miraflores locks. Photo by Brian Gratwicke, License: CC-BY-SA-2.0. Click image for larger view. Building the canal had been plagued by many problems, including disease, particularly malaria and yellow fever, and landslides. By the time the canal was completed, a total of 27,500 workmen are estimated to have died in the French and American efforts. Building the canal was one of the largest and most difficult engineering projects ever undertaken. This great shortcut, the Panama Canal, greatly reduced the amount of time taken for ships to travel between the Atlantic and Pacific Oceans. It connected the two oceans, thus enabling them to avoid the lengthy and hazardous Cape Horn route around the southernmost tip of South America, the Drake Passage or Strait of Magellan. The shorter, faster, and safer route to the U.S. West Coast and to nations in and around the Pacific Ocean allowed those places to become more integrated with the world economy. While the canal was being designed and constructed, ownership of the territory that is now the Panama Canal was first Colombian, then French, and then American. 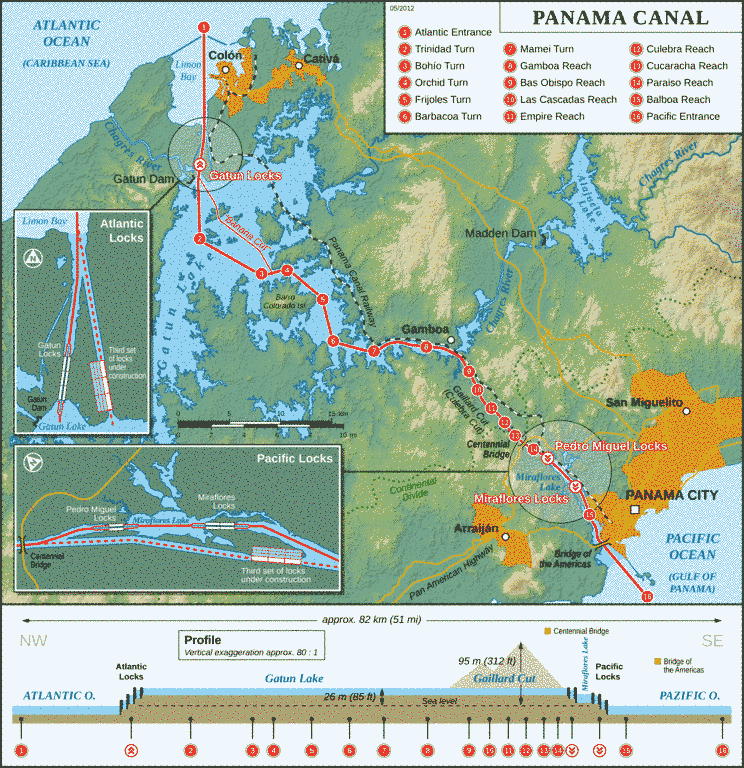 After it was finished the US continued to control the canal and surrounding Panama Canal Zone until 1977. Then in that year Torrijos–Carter Treaties provided for handover to Panama. After a period of joint American–Panamanian control, the canal was in 1999 taken over by the Panamanian government. The canal is now managed and operated by the Panama Canal Authority, a Panamanian government agency. Annual traffic through the Panama Canal has risen from about 1,000 ships when the canal opened in 1914, to 14,702 vessels in 2008. By 2008, more than 815,000 vessels had passed through the canal. Today the largest ships that can transit the canal are called Panamax. The American Society of Civil Engineers has named the Panama Canal one of the seven wonders of the modern world. The most expensive regular toll for canal passage to date was charged to the cruise ship Norwegian Pearlon April 14, 2010. The ship paid US$375,600 to cross the canal. The average toll is around US$54,000. The highest fee for priority passage charged through the Transit Slot Auction System was US$220,300, paid on August 24, 2006, by the Panamax tanker Erikoussa. That fee allowed the ship to bypass a 90-ship queue waiting for the end of maintenance works on the Gatun locks. By bypassing all those ships a seven-day delay was avoided. The normal fee would have been just US$13,430. Since opening, the canal has been enormously successful, and continues to be a key conduit for international maritime trade. The canal can accommodate vessels from small private yachts up to large commercial vessels. The maximum size of vessel that can use the canal is known as Panamax. However, an increasing number of modern ships now exceed this limit, and are known as post-Panamax or super-Panamax vessels. Now a typical passage through the canal by a cargo ship takes approximately 8–10 hours. Because of improvements made during the 100 years since the canal opened, over 14 times more ships pass through the canal locks each year than did originally when the canal opened. The Panama Canal has made a huge difference in commerce between countries since its opening. This year 2014, marks the 100th anniversary of it being open. Take this quiz about the Panama Canal and see how much you’ve learned or remember. 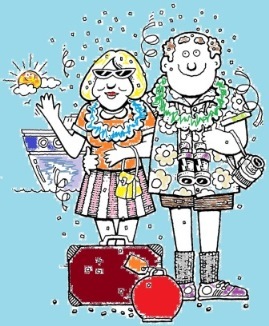 This Travel Quiz is about the Panama Canal. There are 4 – 6 clues to help guess some of the answers. This test has both multiple choice and true false answers. The level of this test is medium. 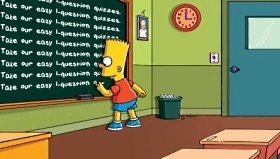 Answer all questions. The multiple choice question answers are worth about 10 points each and the true false answers are worth 8 points each. If you don’t know the answer it is better to guess (unless you want a guaranteed zero for the answer). This test is timed (4 min) so be aware of that. If you ever go to Central America or Panama you might want to visit the Panama Canal. This engineering masterpiece took about thirty-four years in total to build counting the time no work was done on it. Don’t miss the canal if you are ever in the area. Thanks for taking this quiz on the Panama Canal. On August 15, 1914, the Panama Canal opened, connecting the world’s two largest oceans. Stephen Ives’ documentary celebrates one of the world’s most daring technological achievements. The French began the canal in 1880, but were ultimately beaten by the enormity of the task and the virulence of the endemic tropical diseases. They left behind not only a partially completed canal, but also a mountain of debt. 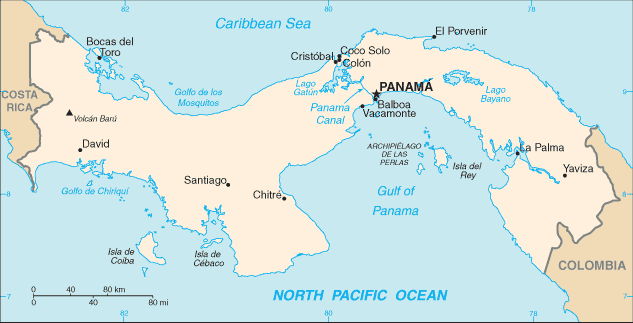 It was not until 1904 that America took over the project, having formally recognized the new country of Panama. There followed ten years of ceaseless toil, costing over 350 million dollars and an estimated 5,000 lives. A few days ago we cruised on a huge cruise ship though the Panama Canal. Our ship only had two feet of clearance on each side. It was spectacular. I saw a crocodile but did not catch it on film. The entire process took about eight hours and it cost our ship over 400,000 dollars to go through. If you’ve never been through, it’s a must see before you die. It is considered the greatest engineering feat every completed. The Panama Canal in Panama connects the two bodies of water and cuts across What? It cuts across the Isthmus of Panama. 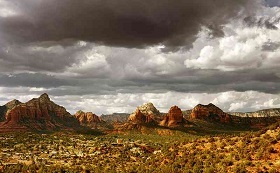 It is a narrow strip of land connecting two larger land areas, usually with water on either side. The strip of land has a special name. Two dangerous diseases, which are still around today killed many of those workers what were those two diseases. Yellow Fever and Malaria were the diseases. One of the diseases comes from a flying insect. How many ships are estimated to go through the canal yearly since 2008? Annual traffic has risen from about 1,000 ships when the canal opened in 1914, to 14,702 vessels in 2008. It is less than 30,000. What country gave up on working on the canal due to a large number of deaths? France began work on the canal in 1881, but had to stop because of engineering problems and high mortality due to disease. The two bodies of water that the canal serves are at different levels. 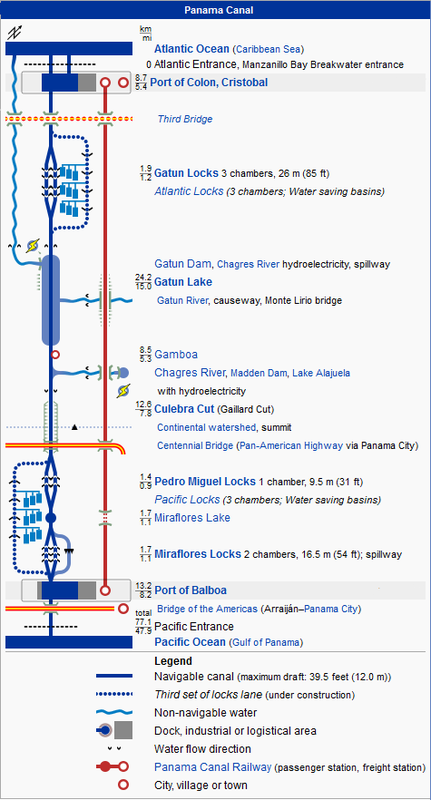 The water that is used to raise and lower vessels in the Canal is fed by gravity from Gatun Lake into each set of locks. Since a ship will have to go upward to Gatun Lake first and then descend, a single passing will cost double the amount; but the same waterflow cycle can be used for another ship passing in the opposite direction. Unfortunately, like in so many things, times have changed and the canal is now almost worthless. The canal is currently handling more vessel traffic than had ever been envisioned by its builders. To improve capacity, a number of improvements have been imposed on the current canal system. Part of the question is correct, part incorrect. What does the Panama Canal connect? The Atlantic Ocean (via the Caribbean Sea) to the Pacific Ocean. It connects the largest Ocean with another very large body of water. The canal ultimately connects two big oceans. About how many workers were estimated to have died during the project to build the canal? About an estimated 27,500 workers died. It was more than a few. It was so many the French gave up working on it. The answer was in the article. According to the chart what is the minimum cost to pass through the canal? The chart is in the article. When was the Panama canal completed and opened? The United States took over the project in 1904, and took a decade to complete the canal, which was officially opened on August 15, 1914. It was later than 1890. It was after the first decade of the 20th century. The US built the canal and runs it efficiently. The US built the canal but no longer runs it. The canal was in 1999 taken over by the Panamanian government. It is now managed and operated by the Panama Canal Authority, a Panamanian government agency. Part of the question is correct, part is incorrect. Panama, Panama Canal, Panama canal video. Bookmark.